More background info: When the Khmer Rouge seized power in 1975 they instantly set upon their crazy plan of turning the country into some kind of agrarian utopian society – in fact the most anti-intellectual movement of all time. All people living in cities or towns were forced out to work in rice fields and the like. (Phnom Penh became a ghost town!) Teachers, doctors, anybody knowing a foreign language or even just wearing glasses was seen as a danger to the "course of the revolution" and had to be exterminated. All this was well depicted in the film "The Killing Fields", which tells the story of an American journalist Sidney Schanberg and his Cambodian interpreter Dith Pran at the time just before and during the Khmer Rouge take-over. Schanberg got out in the nick of time but Dith Pran was captured by the Khmer Rouge and lived through the genocidal period. He survived and became one of the key figures to tell the world about what was going on in the country at the time. 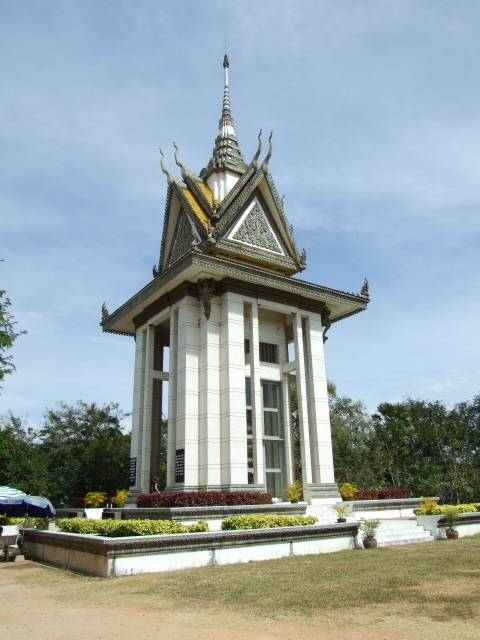 In fact it was apparently Dith Pran himself who first coined the term 'killing fields' – the word has become the metonym of genocide (post-Holocaust) in the second half of the 20th century (e.g. it is sometimes also applied to sites of genocide in Rwanda). 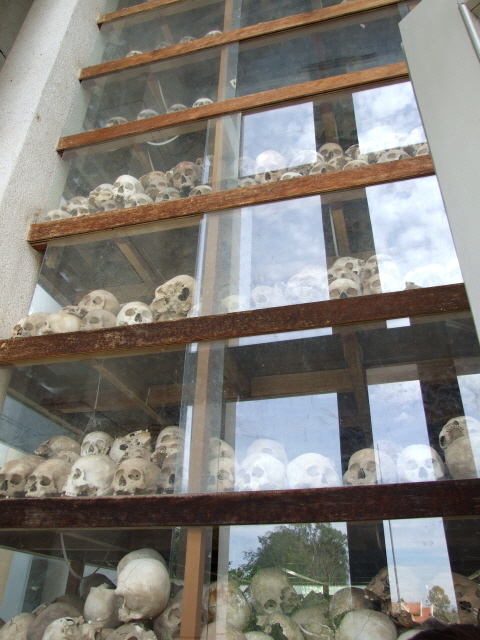 It is important to note that there were indeed many killing fields in Cambodia, not just the one. But Choeung Ek has become the one which stands for all the others. It is hard to arrive at any definitive figures, but estimates run between 1.5 and 2.5 million killed during the period. That's up to a quarter or even a third of the entire population at that time. It's the worst case of a so-called 'auto-genocide' in world history. Most died as result of poor living conditions, though – worked to death, starved to death. With the removal of the intelligentsia, all medical services disappeared too. Combined with long-term malnutrition this was of course a recipe for death and disaster. 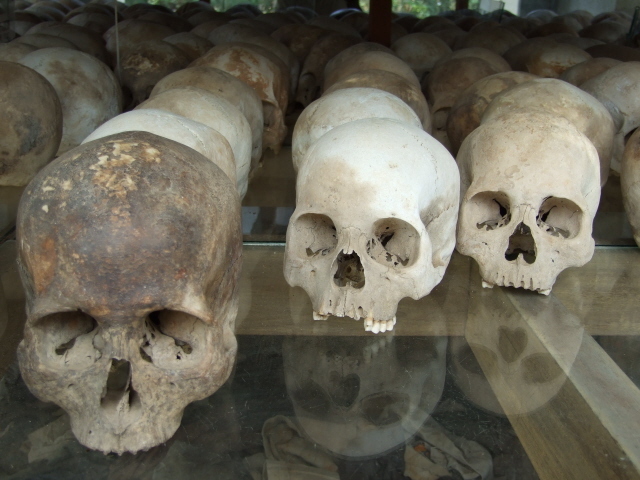 But the Khmer Rouge also actively murdered hundreds of thousands of people – and most brutally too. Anybody suspected of whatever 'treason' (often nothing at all, anything could be made up) could be taken away and killed. To save on ammunition the murderers took to battering their victims to death rather than shooting them. The killers themselves were potential victims – if they didn't carry through the killings they were ordered to, they'd be the next to be battered to death. 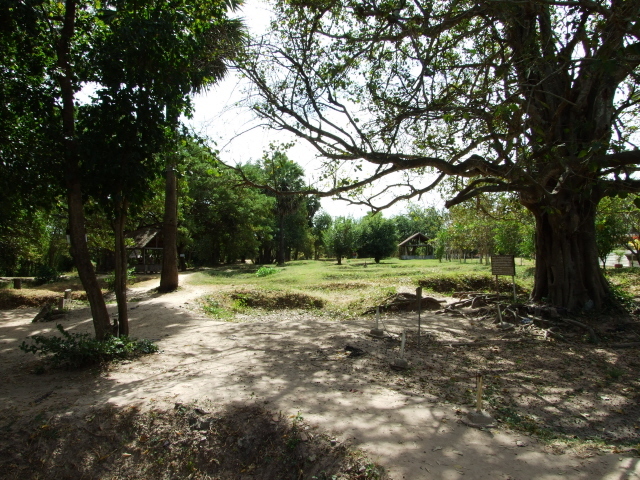 The site at Choeung Ek was the killing site for the victims of the most notorious of those security prisons: S-21, or Tuol Sleng, in Phnom Penh. 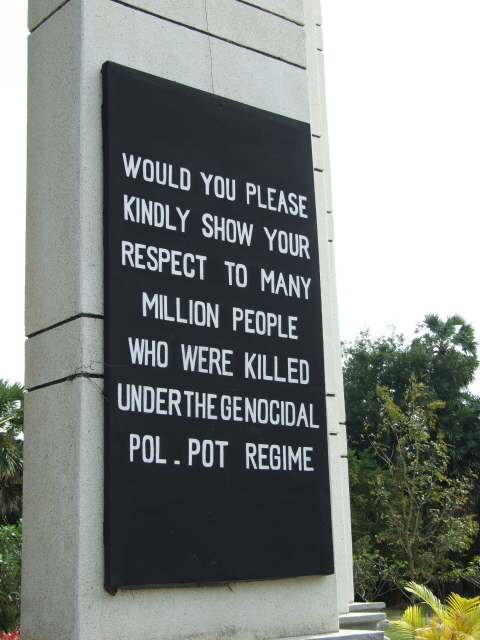 Some 17,000 people were murdered at Choeung Ek alone. Behind the memorial stupa lie the mass graves – you can see the depressions in the ground in what is otherwise a grassy field with a few trees. (Before being put to this grim use, the area was an orchard and a Chinese cemetery, traces of which can also still be seen.) 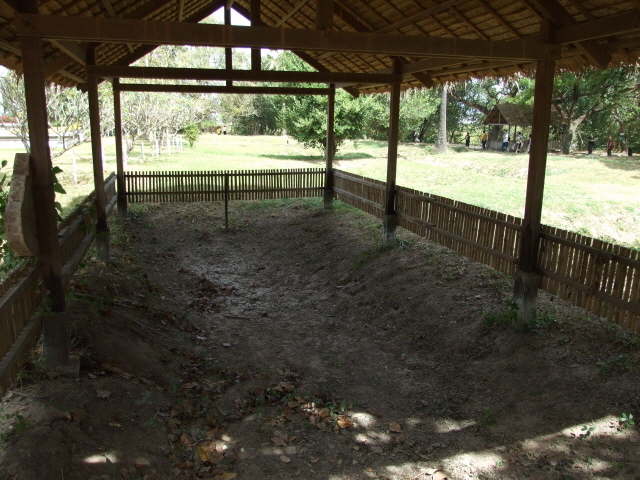 Some of the mass grave hollows are protected by bamboo roofs, others lie in the open. Bone fragments can still be seen on the ground, and at one point collected in a couple of smaller shrine-like containers. Needless to say you are not supposed to take any such fragments away with you. There are informational text plaques put up at various points around the circuit of the grounds. These explain where victims would have arrived, what types of mass graves were found (e.g. one containing only women, presumably raped – another one with corpses without heads, and so on). 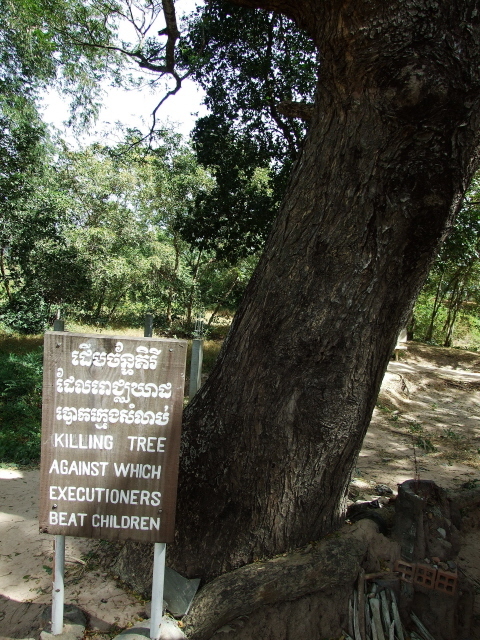 One tree is marked as the one used to beat children against! (The Khmer Rouge stopped at nothing!) Another tree used to have loudspeakers fixed on to it (you can still see the scratch marks from the wires) – to drown out the screams of the victims with loud music. There are also a few photos on display, e.g. 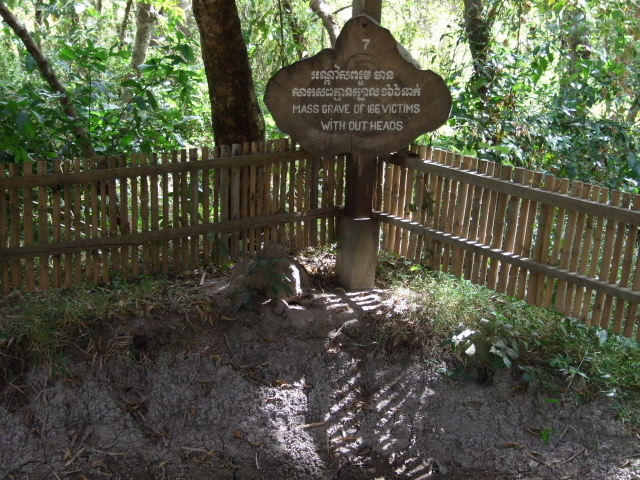 of victims and of the killing fields as they looked when they were discovered, together with short explanations. Texts are in Khmer and English … the latter often in a slightly bewildering flowery style; and the translations are clearly not always spot-on either. But some slightly dodgy English can be forgiven … the overall meaning comes across alright..
At the time of my visit (Christmas Day 2008) there was a new building being built – supposedly this is to be a new museum proper at the site. Some of the previously open-air text-and-photos displays will presumably by now have been moved there and/or augmented by additional material. But this remains to be seen (please notify me if you've been and can comment on this latest development – contact). The site is perhaps surprisingly popular – when I visited several tour groups were there (in addition to scores of independent travellers) so at times it felt just a little too crowded for the otherwise grim and desolate atmosphere the place exudes. Worse than the mere presence of the crowds, however, was the behaviour of some tourists. Unfortunately this is something you occasionally have to witness at sites like these (see also e.g. Auschwitz, Stutthof, Sachsenhausen – and generally: ethical issues). Here some tourist-tourists (video-camera-wielding, garish T-shirts, and all) clearly didn't understand the gravity of the site and pranced about posing for snapshots in front of the mass graves as if they were some kind of Disneyland ride or something. I've heard stories of even guides not being altogether respectful (and whether it's appropriate to have beer adverts on the benches at this site is also a bit questionable), but that doesn't mean visitors can feel free to behave even worse. No. Respectful behaviour is a must at a place like this! There are even several signs reminding you of this at the site, including several ones nailed to trees admonishing visitors to remain quiet. 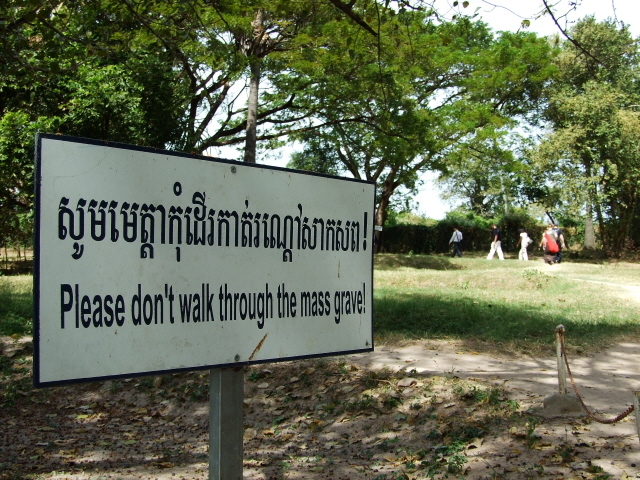 And there was sign that read "please don't walk through the mass grave" – where else in the world could you find a sign like that?!? – captivating! Apparently there are supposed to be local guides taking visitors around, though this wasn't obviously so. In any case, we had a tour guide for our entire stay in Phnom Penh anyway, and it was him who took us around parts of the grounds – but also leaving us time on our own to wander at our own pace. He did contribute his own personal story of the times (when he was still a child) … it's at moments like these that you are touchingly reminded of how recently these horrors took place. Virtually every family in Cambodia has been affected by the genocide and its aftermath, and even in the local Asian-style never-lose-face characters emotions can run high when it comes to this. Our guide also expressed quite clear feelings about the then upcoming trials against some of the former Khmer Rouge perpetrators – only some of them! And so late! What enraged our guide most, though, is the fact that only the years of 1975 to 1979 are taken into consideration at those trials, not the many crimes committed in the years that followed, or the fact that so many of the former Khmer Rouge managed to get away with it by cleverly switching sides and finding cushy positions in the current government/bureaucracy of Cambodia. It remains a very touchy subject, that much is certain. Obviously, the experience of Choeung Ek will vary somewhat according to what kind of guide you have (if any), but overall it has to be said that even though there isn't exactly much to see (some complain that it's hardly more than a few pits in empty fields), what it is still gets to you. On balance, though, the Tuol Sleng/S-21 memorial site in downtown Phnom Penh has a little more to offer on the information front. There's a shop/kiosk at Choeung Ek too, selling various books, DVDs, etc. (not all related to what the site is about) and general touristy stuff. 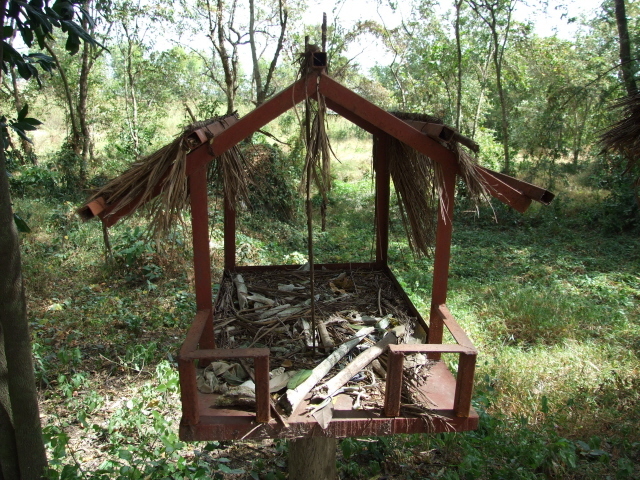 Location: some 10 miles (16 km) south of the centre of Cambodia's capital city Phnom Penh near the Tompum/Tra bak lake. Access and costs: fairly easy and inexpensive. Details: if travelling independently, it's best to get a taxi (or tuc tuc/moto if you dare) to the site. (Other forms of public transport are scant and not recommended for tourists). It's about a 30-minute drive (depending on traffic) from the centre of Phnom Penh. Opening times: daily from 7:30 a.m. to 5:30 p.m. These days an audio-giode is also offered, but not having used one when I was there I cannot say anything about that. 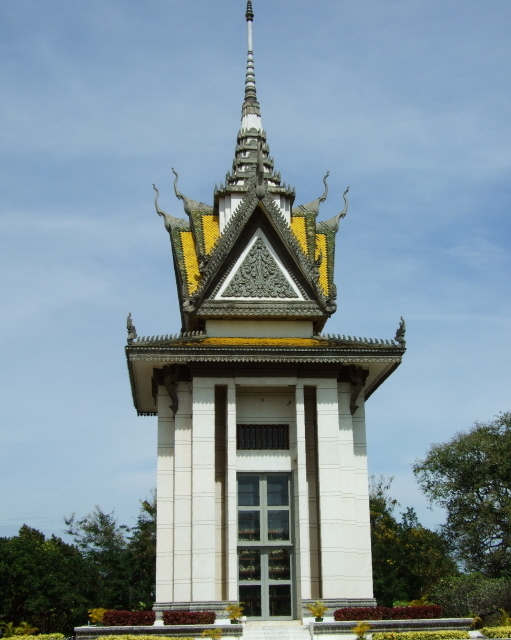 Combinations with other dark destinations: in general see Cambodia – the one most immediately obvious other genocide-related site is that of Tuol Sleng/S-21 in Phnom Penh. In fact it may be a good idea to go there first (as the victims did) and only then go and see Choeung Ek. In Phnom Penh itself there are no other dark tourism sites proper – although various places are now trying to cash in on the popularity of the two big sites: e.g. there's now apparently a Khmer Rouge themed café near Tuol Sleng, and the Mekong River restaurant/bar on the Riverfront screens films about the dark days of the Khmer Rouge and the landmine legacy; the historic FCC with its photo gallery is also worth a look (see under Tuol Sleng for more details). Combinations with non-dark destinations: see under Tuol Sleng and Cambodia in general.